Over the course of the twentieth century, Sweden carried out one of the most ambitious experiments by a capitalist market economy in developing a large and active welfare state. Sweden's generous social programs and the economic equality they fostered became an example for other countries to emulate. Of late, Sweden has also been much discussed as a model of how to deal with financial and economic crisis, due to the country's recovery from a mid-1990s banking crisis. At that time economists debated whether the welfare state caused Sweden's crisis and should be reformed - a debate with clear parallels to current concerns over capitalism. 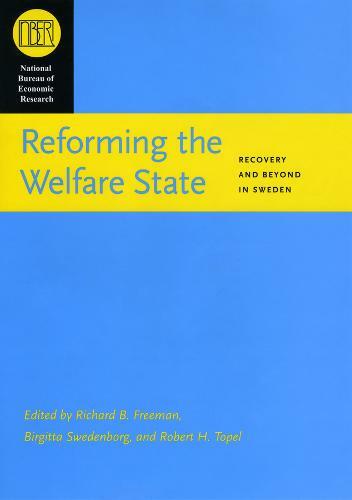 Bringing together leading economists, "Reforming the Welfare State" examines Sweden's policies in response to the mid-1990s crisis and the implications for the subsequent recovery. Among the issues investigated are the way changes in the labor market, tax and benefit policies, local government policy, industrial structure, and international trade affected Sweden's recovery. The way that Sweden addressed its economic challenges provides valuable insight into the viability of large welfare states, and more broadly, into the way modern economies deal with crisis.